Not many high school athletes train that hard over the summer break. What do you have to do to motivate them? Just imagine, wouldn’t it be great if your high school athlete could get off the couch and do some meaningful training this summer? Some Tonopah High School parents found a solution to the couch potato blues. Jo Eason/Special to the Times-Bonanza & Goldfield News Derek Eason in a Muckers basketball game this year, where he played point guard. Senior Tessa North and graduate Heaven Fitch, working the concession stand at the mining park during Jim Butler Days. The two will be playing volleyball with Down Under Sports in Australia from July 11-July 22. This summer four athletes from Nye County are getting to do just that. The four will travel the world playing the sports they love while they travel. The athletes this year are all from Tonopah High School. Heaven Fitch, Tessa North and Kevin Pope are headed for Australia on July 11-22, with Down Under Sports. North and Fitch will be playing volleyball while Pope will be wrestling. 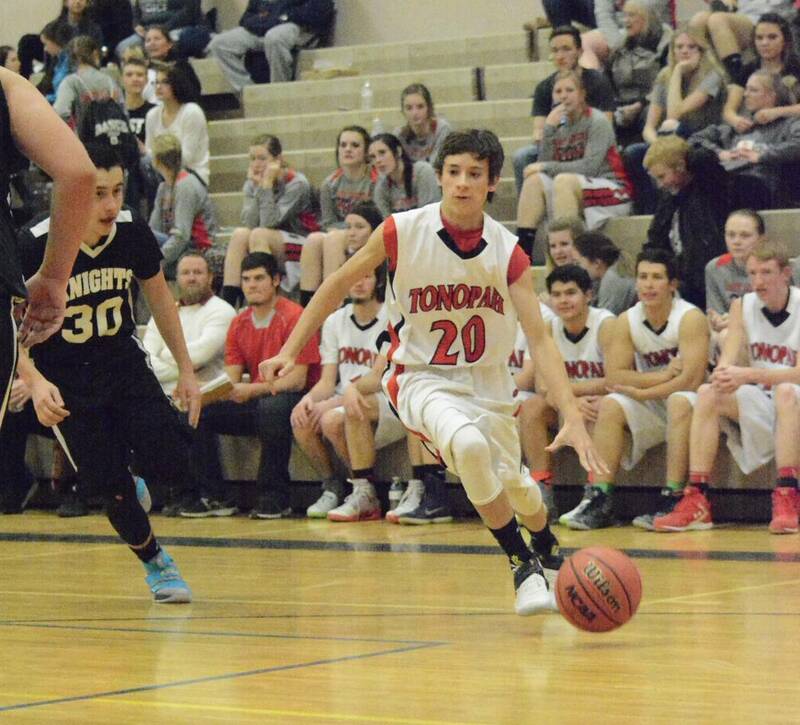 Derek Eason, a Tonopah sophomore, was a three-sport athlete in football, basketball and track and will be going to Europe in a different program to play basketball. In the fall, Tessa will be a senior, Kevin will be a junior and Heaven will attend UNLV. Down Under Sports athletes have a lot of expenses to cover and usually do a lot of fundraising. 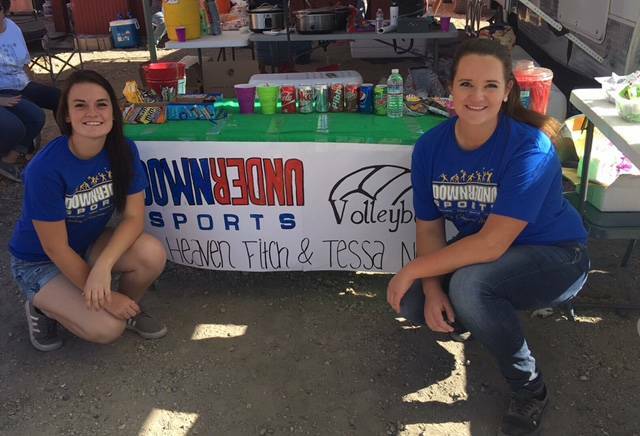 Both of the volleyball players and the wrestler from Tonopah worked a lot of hours raising funds to go on the trip. North and Fitch spent 10 hours fundraising during Jim Butler Days. The girls are still fundraising for their trip to Australia. According to Melissa Fitch, Heaven’s mother, there is a 50/50 raffle going on now. She said the sponsor chooses a number from one to 100 for $10 each and then the purchased numbers are put into a hat and the person who purchased the winning number wins 50 percent of what was taken in. Heaven Fitch is excited she is going and thanked all the people that contributed. She also thanked Frito-Lay, Harris Ranch and Scolari’s Food and Drug Company. In the past, Pahrump also has sent athletes to Australia through the Down Under program. Two years ago, Trojans golfer Austen Ancell went to Australia to play golf with Down Under athletes traveling the world playing sports. It proved to be a once-in-a-lifetime experience. Down Under Sports is a company that arranges for American athletes to go to Australia to compete in sports at the high school level each year and has been in business for 28 years. Trojans wrestling coach Craig Rieger participated in Down Under Sports in 2000 and said the organization did a great job. STUDENTathleteWorld does something similar with Europe. Eason will be headed to Europe in another program called STUDENTathleteWorld. According to STUDENTathleteWorld, Student-athletes are selected from a National pool based on athletics, leadership ability, and character. Eason, a local football, basketball and track student-athlete from Tonopah High School has been selected by STUDENTathleteWorld to represent the United States in the United World Games, an International Sporting Competition to be held in Klagenfurt, Austria on June 21, 2017. He will be playing basketball there. His parents are excited that he has this opportunity. “Derek has always had a passion for basketball,” Dan Eason said. “One of his goals is to make the European league or “D” league. Being invited to play for this team will hopefully expose Derek to new styles of coaching at a faster paced, higher level of competition, giving him a better perspective of the game. Derek Eason will also be doing a fundraiser so that he can go on this trip. He will be manning the concession stand at the annual Rotary Club of Tonopah Annual Kids Fishing Derby at Sportsman’s Park. Fishing starts at 8 a.m.
Derek said he is thankful for all the help he has received. For additional information contact Cindy Kaminski at 775-482-4035. The Rotary Club of Tonopah will host the annual fishing derby at Sportsman’s Park from 8 a.m.-noon on Father’s Day. She said kids ages 2-5 fish from 8 a.m.-9 a.m., kids aged 6-9 from 9 a.m.-10 a.m., and kids aged 10-12 10 a.m-11 a.m. Kids will receive prizes for the biggest fish, the heaviest fish and the smallest fish. Prizes were donated by H&R Block. Kaminski also thanked the Nevada Bighorns out of Reno and the Rocky Mountain Elks Foundation for their donations and help with this event. “This is a great event and the kids just have the greatest time,” Kaminski said. Sportsman’s Park is off Highway 376 about 10 miles from the Highway 6 junction.